This page is about the French premium fighter Yak-3 (France). For other uses, see Yak-3 (Family). 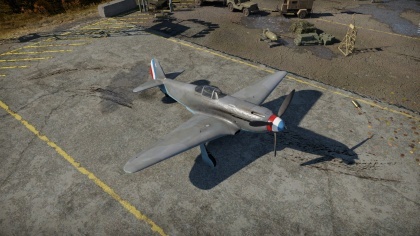 The ▄Yak-3 is a premium rank III French fighter with a battle rating of 4.0 (AB/RB) and 4.7 (SB). It was introduced in Update 1.77 "Advancing Storm". 685 320 ??? ~?? ~? 8.5 mm Steel plate - behind pilot 64 mm bullet proof glass - behind pilot's headrest 10 mm Steel plate - above pilot's head. 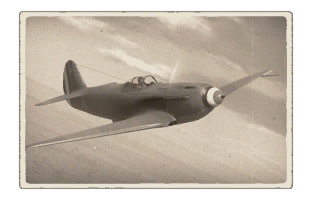 The Yak-3 is the pinnacle of the piston engine Yakovlev design, with a much more powerful engine, the addition of a second MG (meaning the MGs are viable now! ), and metal wings! The coolant system, now actually somewhat effective, has been moved to the wing roots (no "smiley face" below the nose), making the plane more streamlined. The cannon - the same old 20mm ShVak - receives a pleasant upgrade: very effective Air Targets belts. Overall, the Yak-3 can be considered as a "jack-of-all-trades, master-of-none" aircraft. It will readily fulfill any fighter role a pilot will put it in, however, it won't excel in any – the American and German aircraft will still be better at energy fighting and executing Boom & Zoom tactics, while the British and the Japanese planes will still have an edge in maneuverability. Yet, the Yak-3 is a very potent machine which, with a skilled pilot behind the controls, is an opponent that you don't want to underestimate. This premium aircraft comes furnished with all modifications unlocked upon purchase. This page was last edited on 7 April 2019, at 13:06.